The third version of the popular Women’s Sperry Top-Sider pelican boot. Available in 3 different designs – Black quilted, Anchor graphic and nautical navy and white. This boot features a notched elastic panel with an adjustable gold colored buckle for the perfect fit. Really nice boots, I would recommend going a half size up if you want to wear thick winter socks. Great buy. Very pleased with these boots. I have quite wide calves and these fit perfectly. I would thoroughly recommend these. Really cute boots, I bought the black quilted ones and they look great. Great boots, perfect fit for me and really comfortable. This is the first time I have bought Sperry boots and I would buy them again. Good buy. very warm and comfortable. 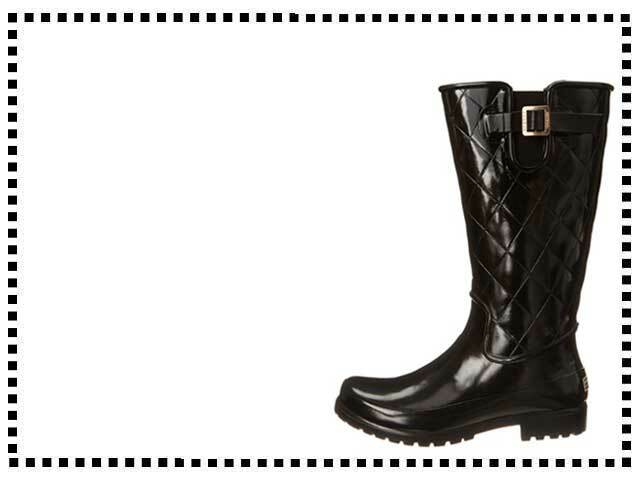 Quality rain boots with adjustable width buckle.